Yes, we’re most often mostly about hockey, but are of course ultra-excited indeed to offer this hobby icon, the most recognizable, important and valuable gum card of the post-war era. 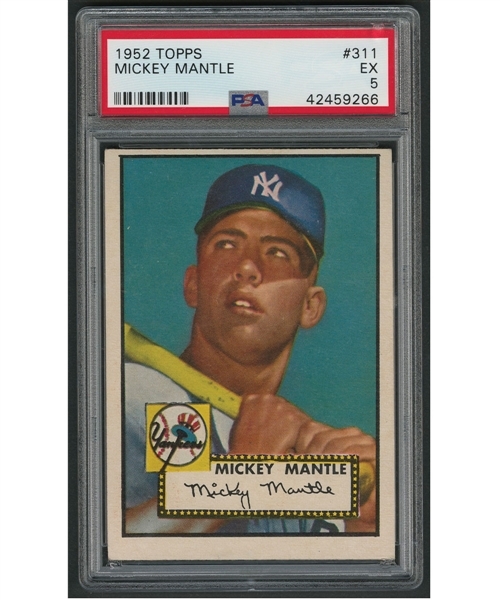 Not sent out to sea as reportedly an inestimable number of 1952 Topps high numbers were, this Mickey Mantle survived and will live on as an EX 5 example, with PSA recently examining and encapsulating the captivating specimen. Touches at the corners are visible, along with an edge notch to the left of a minuscule white print dot, near the border in the upper left quadrant. Another white spec appears in the cap of the young Yankee centerfielder, heralded, like the write-up on the back informs “as Joe DiMaggio’s successor.” Side-to-side centering is close to perfect, with the bottom border out-measuring the top and actually no grey visible to the left of the red strip on the back that is home to that famous number; “311”. An impressive surface, free of any hints of scuffing, include an unblemished team logo and caption block. Tempting and alluring, this Mick is sure to give the new owner an exhilarating feeling; to possess, hold and behold a ’52 Topps Mantle is a stirring privilege to render one proud, proud.